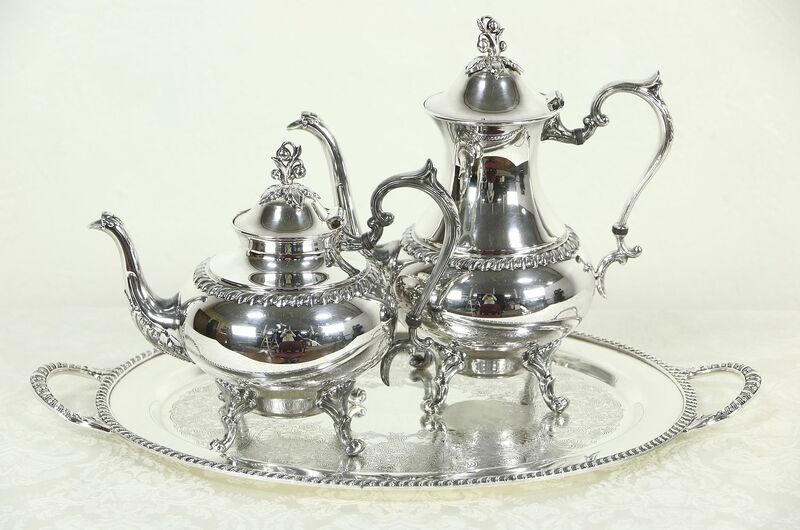 A richly detailed silverplate tea and coffee set with tray is signed "Avon" pattern by Rogers. Rope borders and floral lid handles are beautiful on this American made vintage silverware. There is wear on the teapot handle, the lower coffee spout and some scratching on the tray, see photos. Pieces have nice weight and rope borders. Tray size is 21" long, 13" wide and 1 1/2" tall, the coffee pot is 11" across, 6" wide and 11 1/2" tall. Standard Shipping is $40 in the US.